One of my best bloggie friends in the Universe (hi, Jenn!) introduced me to the Art of Zentangling. For those of you who don't know or haven't tried it yet, to Zentangle is the art of meditative drawing in some repetitive form that's relaxing and almost soul-searching (that's why the "Zen"). 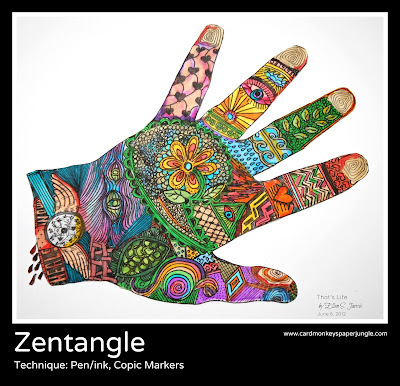 This week's theme over in the Artist's Play Room is "Let's Zentangle." And since I've never done it before, I decided to (literally!) try my hand at it. Now do your own. It doesn't have to be representative of anything. Just relax... and draw. A typical Zentangle is black and white or black and shades of gray on white. So I kept my original of this piece of art as just black waterproof archival pen on white. Then I made a copy of it, printing onto watercolor paper, and colored it in using my Copic markers. After I was content with the color, I trimmed it off its sheet and pop-dotted it onto a thicker watercolor/artists' paper, suitable for framing. I'll be posting this Zentangle on Jenn's Artist's Play Room ... and hanging it in my PaperJungle, just for fun and inspiration. What have you done for you today? can I say?? Your bestie is SOOOOOOOO proud of you to see you branching out to your own artwork, your own design. Beautiful Ellen. I love it and I think it's a perfect thing to hang on your wall, it'll wave at you every timde you're in there. What a fun site you have:-) Your hand-tangle is marvelous. It is so much fun to tangle, love your use of color too. I'm fairly new to the subject but see many tangles in my future. I am learning that there is so much more to zentangles than I thought. I always stress when doing them, guess I need to chill out a little. Had a closer look at your hand, just amazing, so much detail. It is truly beautiful. This is so gorgeous! I didn't get to play this week and nothing I could have done would ever measure up to this beautiful piece. Very stunning, I love it in color!! I am going to also do with with my students this fall. It would be a wonderfully relaxing way for them to fill those quiet moments while waiting for their classmates to finish up. AND they could be used to make a Mother's and/or Fathers Day gift later in the school year. Your hand is amazing...and the colours...Wow! I've not been drawing zentangles for long, but I'm having a great time doing them. My mind wanders off somewhere but I have no idea where. I find them sooooo relaxing.